Hardcover with jacket, 272 pages, 13.5 x 21.5 cm, 5.3 x 8.5 in. Every life ends in death. Sometimes, however, death comes very suddenly and cruelly. Alfred Riepertinger is a specialist in enhancing the appearance of dead bodies in such a way that relatives can say farewell in dignity. This is particularly important when accidents, suicide or dreadful crimes are involved. 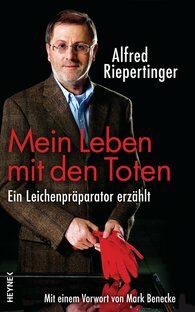 Here for the first time Alfred Riepertinger tells of some of his most unusual cases and his moving encounters with the dead and their relatives.